I was able to speak by phone about three hours ago to my old friend Matt Daley, my former radio partner, who decided to go back to school and get a second degree this year. His first degree is in mass communications, his second degree will be in sports management. Matt chose one of the best sports management programs in the country to get that degree- the program at Bowling Green State University in Bowling Green, Ohio. Matt was able to get tickets for today's game between Ohio State and Bowling Green at Ohio Stadium (which Ohio State leads 21-0 in the second quarter as I write this), and he called to brag just a bit about the great seats that he was able to snag (you know it is a call to brag when the first words out of your buddy's mouth are "you'll never guess where I'm sitting"). His call spawned a discussion about why large schools like Tennessee, Alabama, Ohio State, Auburn, or Georgia play small schools like MTSU, Bowling Green, UAB, or Georgia Southern. We are prone to write off these small opponents that play our favorite college teams as "gimmie games" and frequently enough they are just that. What we forget is that the reason such games take place has as much to do with the smaller schools as the great powers of the game. If the small schools never had the opportunity to play the old powers, they would never generate enough money in today's college football climate to keep their programs and their small conferences (such as the MAC) alive. Bowling Green, for example, was given over $600,000 to play Ohio State today-enough to run their football program for the rest of the year. Small schools are where the game was born, and it would be a miscarriage of justice for those institutions never to have their day in the college football sun. Aside from that, if there were no big vs. small games in college football, we would never hear of the impossible upset, which very occasionally does happen. The Cluster Map at the bottom of the sidebar is now functional, and you can view the locations from around the world where The World is receiving daily visitors. There has been some speculation about the nature of the call for an investigation into the Harber Affair in Knox County. Are there some who think that merely calling for an investigation will be enough to silence those of us who have spent a whole lot of time and energy beating the drum for this entire matter to be thoroughly examined. Of course, just bringing it to the floor isn't enough-for the Harber Affair to be resolved in an appropriate manner the Knox County Commission must investigate the matter with the power to subpoena evidence. Gene Patterson is quite right that it will take 13 votes from the Commission to investigate with subpoena power. As of this morning it has been passed from several sources to The World that the Commission does not have those 13 votes, but it could have them in the coming days. That is why there may be a method to Greg "Lumpy" Lambert's madness. Lambert is telling the press that he believes Mike Ragsdale is innocent but that this investigation is needed in order to "clear people's good names." It is good logic, because if Mike Ragsdale, Mike Arms, and the rest of the County Mayor's office is innocent of any wrongdoing, they would want an investigation-so would Ragsdale's supporters on the County Commission and in the Knox County Republican apparatus. The reason that an innocent Team Ragsdale would welcome an investigation into the Harbergate Affair is because if Mike Ragsdale is innocent, he comes off smelling like a rose. If he and his supporters on the Knox County Commission are intent on avoiding an investigation, it appears that they may have quite a bit to hide. For the record, Mike Ragsdale has denied any wrongdoing in a very public way, as he appeared on Tennessee This Week and broke a lengthy silence about the Harber Affair. President Nixon also denied wrongdoing in the Watergate Affair, but when the matter was actually investigated the truth of that denial became far less clear. If Ragsdale is found to have had any role at all in such activities, however small that roll might have been, the necessary steps should be taken to remove him from office post-haste. If Mayor Mike Ragsdale is indeed found to be completely innocent as he himself claims, then the man who would be Governor comes out of an investigation looking like such a good public servant that his enemies will do anything to destroy him. If Ragsdale has done nothing wrong, he not only has nothing to lose from an investigation, he has everything to gain politically. I challenge Mayor Ragsdale to let East Tennesseans see and hear of his innocence, and let us judge the situation for ourselves. As an innocent man who has been falsely accused (and who wants to be Governor in 2010), not only should he embrace a full and complete investigation, it would speak volumes about his character if he openly encouraged commissioners to vote for the subpoena power so that his innocence (and the "personal vendetta" he alleges that his opposition has against him) might be proven for all to see. Further, when these special hearings begin, let them be televised on T-SPAN government access all over East Tennessee so that the public can see just how badly an innocent man has been maligned. The major Knoxville television stations might consider airing large portions of the hearings each day so that the maximum number of citizens can be made aware of this terrible miscarriage of justice. Let us have Harber in the morning, Harber in the evening, Harber at suppertime. When everything is finally aired in the open, then the people can determine who they believe. Then again, if the Mayor is innocent and his supporters on the Commission do not join other Commissioners in voting for subpoena power, then reasonable people must then be forced to ask: What are innocent people hiding from? Well it took weeks of pressure from the blogosphere, but it looks like the Knoxville News-Sentinel is finally reporting that the Harbergate scandal is a real news story. Mind you, certain bloggers were already all over this story in the days before the Halls Shopper News even published a word of it. Betty Bean deserves high marks for the courage to stick with this story to the point where it can't be ignored any longer. If this entire affair has shown anything, it has shown the local press if not the world that bloggers and citizen-journalists and editorialists cannot be ignored. We are the people on the ground where the news is happening. Van de Vate also noted that the Sheriff's Office has investigated Harber for more than a year and a half, including using computer forensic technicians and "highly ranked staff attorneys." He said the attorney general has reviewed the case at least twice. "If all of this didn't find a problem, what will a commission investigation accomplish? Who will actually investigate for the commission? Will they take over the computers and the rest of the evidence the sheriff has? Will they re-interview the witnesses? Will they question the detectives assigned to the case?" First of all, the Sheriff's office has investigated Harber and Adam Groves for some time now, I am not sure that it has been quite a year. What's more, they had plenty of information, enough to nail people to the wall-and it is Randy Nichols who refused to act on the matter. Just because the DA refuses to act does not mean a case doesn't exist. As I pointed out at least once here, Groves is reported to have "sang like a canary." The Sheriff's office has more than enough information about this affair to make a case out of it. As for the rest of Dwight Van de Vate's question about whether the Commission will ask for the Sheriff's evidence-I am almost certain they will, and I am equally certain that Sheriff Hutchison will happily provide it. I am also quite sure that this may be precisely what certain people in the Knox County Mayor's office are afraid of. I wanted to update regular readers on a couple of new features to be included here at The World. The first is our new web counter compliments of the folks at ShinyStat. This new counter allows you the reader and viewer to see how many page visits (as opposed to hits) The World is getting each month and the total number of visits per day. The new features of the counter also allow me to see how many visits the site is getting per day and can give me a breakdown of visits per hour and peak hours for visits to this weblog. 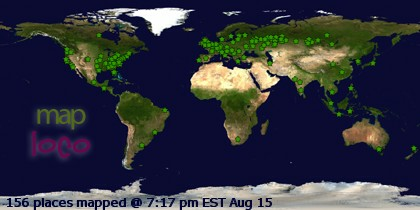 The second new feature is our world wide Cluster Map from the people at Clustrmaps.com. Beginning tomorrow, this new map will show all of our readers where folks are logging into The World from. I hope readers enjoy these new and exciting features. To view the web counter and the map, simply scroll down to the bottom of the page. It looks like the investigation called for by The World and Terry Frank may finally be coming to pass. A cadre of three Commissioners led by newly elected Knox County Commission member Greg "Lumpy" Lambert is calling for the Commission to launch an official investigation into Ragsdale's office-something that is long overdue. Officially, Lambert is saying that he believes the Mayor is innocent but that we need to "clear the air." Unofficially I think that Lambert believes that Mayor Ragsdale is guilty as sin, but he wouldn't want to say that because he is afraid to burn bridges. To be fair, Lambert is also under pressure from constituents, supporters (including The World), and friends to live up to the anti-tax, anti-Ragsdale mandate upon which he was elected. As a result, it is he who should be leading the way for justice. I will stand by my words and respect the outcome of any investigation. In the meantime, citizens in Knox County and East Tennessee should demand a thorough, full, and fair investigation into the entire Harbergate Affair. It appears that my calls yesterday for Speaker of the House Dennis Hastert to resign have now been echoed throughout the press, and when The Washington Times openly demands Hastert's resignation, observers can be certain that conservatives are angry. The Times went so far as to recommend that Congressman Henry Hyde of Illinois replace Hastert, largely because Hyde is retiring when the 109th Congress adjourns and has "no dog in this fight." Conservatives are angry, as are all people of goodwill who find the acts of Representative Foley abhorrent. Even the word "abhorrent" does not seem strong enough to express the outrage of many Americans. Conservatives have reason to be more angry than most. Speaker Hastert's inability to confront Foley shows an ineptitude in his personal leadership, an ineptitude that reflects on the leadership abilities of the entire House, whether that sort of broad-brush mentality is the right attitude to have is not important-an eye to the mind of the average voter is. It is important that the conservative press should lead the way in demanding that Hastert leave the Chair. With the election approaching, a quick condemnation from conservatives and a change in leadership shows, if nothing else, that conservatives take these terrible allegations as seriously as they deserve to be taken. Just when I thought there was a good chance that the Republicans would hold the House and Senate and save the Republic from the terrible prospect of Speaker Nancy Pelosi, the wheels fall off. For some time I have said that the GOP majority in the House would not win re-election because they deserve re-election, but because the Democrats can offer nothing better to the American people. What has happened over the last few days has demonstrated the glaring incompetence of Dennis Hastert as Speaker of the House, who was warned about the unseemly internet activity of Rep. Mark Foley of Florida on two separate occasions but failed to act. What's more, Mr. Newt has been all over Fox News trying to defend the Speaker of the House in the face of his ineptitude. There is no excuse for this and I agree with Adam Graham that Hastert should resign immediately. To be fair, Hastert has now called for a full investigation from the Justice Department, but he only did this after nearly two days of intense media pressure, quite a bit of which came from conservatives demanding accountability. At this point, all we can do is pray that the fallout from this terrible wrong burns over before the election. Normally the electorate has short memories and if this had happened in March or April, a small reshuffle at the top of the heap would have saved the day over the long term. We are just over a month out from an extremely pivital Congressional election, and while the electorate's memories are short, I fear that they are not that short. From a raw political point of view, either party would be trying to use these wretched events to their political advantage. Had this been a Democratic Congressman, Republicans would be playing this for all it is worth and would burn up the airwaves with it. We now must pay the piper for failing to act to stop the bleeding when GOP members go awry just as Democrats do. College football Top 25 for the "mid-term"
I really thought yesterday's game between Iowa and Ohio State would be a better game than it turned out to be. It was still certainly the game of the week in terms of the rankings, but the only thing that made it the game of the week was the confirmation that yes, Ohio State is really that good. The surprise was Georgia Tech's upset of Virginia Tech. GaTech is a very good football team, and since they managed to beat out VaTech, this could put them in a position to win the ACC outright. Notre Dame (who whipped in-state rival Purdue) now goes into the lighter part of their schedule leading up to their season-ending showdown with USC. In advance of that game, let me say I am solidly behind Our Lady's Team for that contest.